Over a third of Oklahoma, 52 counties, are in a state of emergency due to the weather conditions and fire danger. Recent rainfall in the state has led to Governor Mary Fallon reducing the burn ban from 36 counties to only 14 on April 26. The burn ban remains in effect for counties in western Oklahoma. As of April 24, the 34 Complex fire in Woodward county was 100 percent contained after approximately 1.7 billion gallons of rainwater fell over the weekend. Rain combined with the tireless efforts of firemen contributed to the containment. The fire burned a total of 62,481 acres. The Rhea fire in Dewey county is 99 percent contained as of April 26. After precise mapping, the Rhea fire burned a total of 286,196 acres. This brings the total acreage burned in Norwest Oklahoma up to 348,677. Rain over the weekend helped firemen get a handle on the flames while reducing the severity of drought and dry fuels in the area. Though the fires are contained, hot spots are still present. According to the Oklahoma ForestryServices, no new fire activity has been reported in both south and northwest Oklahoma. Low humidity combined with high winds sweeping down the Oklahoma plains is the perfect recipe for a wild fire in the Sooner state. Crews have been battling flames reaching over 70 feet in places for the past eight days while images from space clearly depict the flames and smoke blowing across the state. Over a third of the state, 52 counties, are in a state of emergency due to the weather conditions and fire danger. 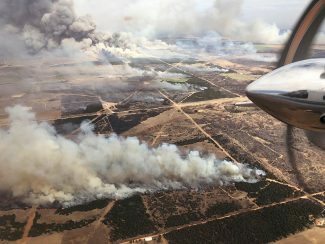 The two largest fires are located in northwest Oklahoma: Dewey County, known as Rhea, and Woodward County, known as 34 Complex. The Rhea fire has burned 289,078 acres and is currently 25 percent contained while the 34 Complex fire has burned 62,089 acres and is 62 percent contained. "It has been historical fire weather in the state this spring," said Shawna Hartman, Kansas public information officer working with the Oklahoma Forestry Service. "With this extreme fire weather comes extreme fire behavior, things that local fireman have never seen in their state before." After the latest inferred flight, the Rhea fire has intense heat both in the fire and near the perimeter, this small break in weather is allowing firemen to focus on controlling the hot spots. While the 34 Complex fire has few hotspots and is significantly less intense than the Rhea fire. Local and national crews fighting the flames have never seen these rates of spread or flames reaching so high. In addition to the smoke billowing from the flames. "Sustained rain would definitely reduce the intensity of how these fires are burning," Hartman said. "It is going to take rain, increased humidity and firemen working to extinguish some of the hot spots in timber and cedar groves to truly contain these fires. Those areas are going to hold heat for an extensive period of time. And depending on how those areas are made up, rain might not even reach where the heat source is burning. Another day or two of the critical weather conditions and those fires could flare back up again." Out-of-state aid has been brought in to give local crews relief after working day and night for several days. Two incident management teams brought in by the Oklahoma Forestry Service are directing resources to manage the flames. These resources include fire crews, engines, aircraft and additional management teams from states that include Arkansas, Alabama, Florida, North Carolina and Texas just to name a few. "For the most part, pastures, fields, rural homes and small towns have been effected the most," Hartman said. "It is still way too early to evaluate the damage. Many towns have bene effected as far as evacuations go though." Fires in the southwest are almost entirely contained at this point, but only after wreaking havoc on the cotton industry and town of Martha. "The Martha fire started at the cotton gin and the 50-mile-an-hour wind just blew flames all over town," said Rhett Johnson, District 3 County Commissioner in Jackson County, Oklahoma. "Embers blew through the air and fires just popped up all over the place. We lost a total of 15 homes in that one." The town of Martha was in flames the weekend of April 14, and the weekend before that was the Plains Cotton Cooperative Association Warehouse fire. More than $6.5 million dollars in cotton was lost. About 90,000 tons of cotton seed are still on fire east of Altus at a seed plant. "They are having a hard time putting that fire out and it will probably continue for a few months just because of the nature of those seeds," Johnson said. "They are trying to manage the smoke so it does not blow over the Altus Air Force Base or shut down Highway 62. There is a lot of effort going into managing the smoke on that fire." The estimated value of the cotton seeds in flames exceeds almost $20 million. This number only accounts for the seeds lost. "There has been a lot of financial damage in the cotton industry because of these fires," Johnson said. "The total economic loss is still unknown, but I am sure we will feel it for quite some time after the flames go out fully." The fires in northwest Oklahoma are more widespread and burning much hotter than those in the south. However, more of the land burning around Altus is in agricultural production, Johnson added. "Through all of this, we have never been short of water to fight the fires," Johnson said. "Lots of farmers around here have big water trucks and they just continue to show up with water on them. Lines of water trucks as far as the eye can see have sat outside of the fires we have fought. That is the Oklahoma standard everyone hears so much about, just people helping people." Origins of the fires are still unknown, except for a small fire west of Altus that burned roughly 400 acres of pastureland on Monday. "It started just along the highway, so we can guess that it came from either a cigarette or possibly a chain dragging from a trailer that sparked and the wind just swept it away," Johnson said. "That fire threatened a property and quite a few cattle. It was put out before it hit any structures though." More than 1,500 people have been evacuated at this point and two people have lost their lives because of the fires. A combined 400,000 acres either sit in ash or continue to burn today. "There can be critical days with low humidity and high winds where no fires start," Hartman said. "All there needs to be is an ignition source. These can come in a lot of different forms. From someone mowing their yard and a rock hits and sparks to parking a car in tall grass or welding. If we have more of these critical condition weather days, it is important that people understand their outdoor activities can lead to these devastating incidents if they are not careful." Because of the quick response from the state, crews are no longer in need of bottled water or Gatorade. The biggest needs will come once the flames are extinguished and producers begin to rebuild their pastures. "A lot of people don't realize that once your pasture is decimated by a fire and your cattle are still alive, they need to be fed and corralled still," Hartman said. "The Oklahoma Extension Service is coordinating donations for fencing supplies and hay donations. Monetary donations will be the biggest help to the state at this point." Along with the Oklahoma Extension Service, Oklahoma Cattleman's Foundation, Oklahoma Farmers and Ranchers Foundation, Oklahoma Farmers Union Foundation are taking donations on behalf of the effected producers. Preparation for future events is key, Hartman adds. Resources for how to make your property defensible against a fire can be found on the Oklahoma Forestry Services website. "I really encourage people to go to forestry.gov and check those resources out," Hartman said. "This won't be the last time that this critical fire weather will be in effect and fire season will come again. It is really important for people to be prepared."